Are pets or service dogs allowed inside the park? 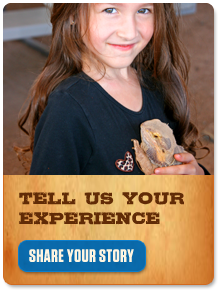 Free roaming animals and free flight birds of prey may be present at Out of Africa Wildlife Park. Furthermore, keepers are frequently in with big cats that are wild by nature. Pets or service animals can trigger instincts that pose a severe risk to our keepers. For the safety of your animals, our guests, and our staff who work with wild animals directly, we do not allow pets and service animals inside the park. We discourage guests from bringing pets and leaving them in parked vehicles. Distressed pets will be removed from vehicles if deemed necessary for the safety of the animal.